ScrapMatters is Having Another CT Call! Hard to believe, but it’s time again for a CT call! Our amazing CT has done a terrific job over the last 6 months and we’ve appreciated ALL their hard work so so much! But the fun has the end sometime and now its time for some new scrappers to join the SM team!! In return for all your work on the CT, you will get full access to our shop!! With all our new designers and constant new merchandise, this is a KILLER deal! You have until Monday, February 11th to apply!! Can’t wait to hear from you!! 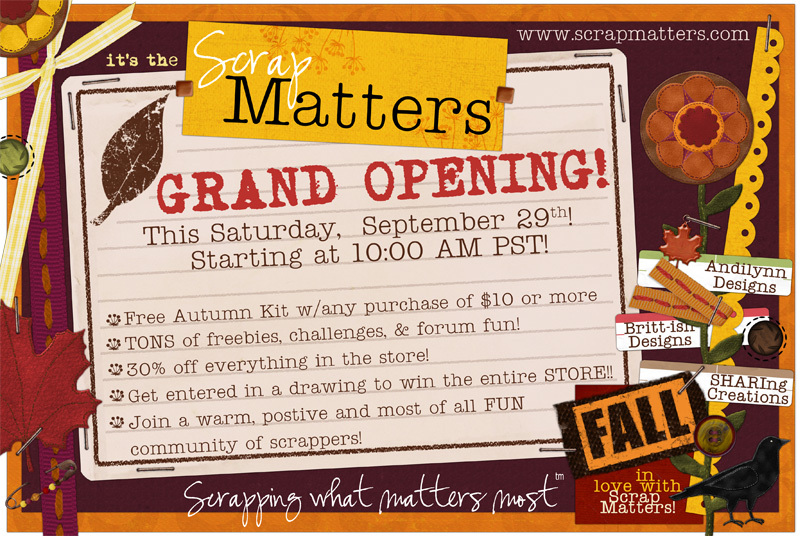 ScrapMatters Grand Opening on Saturday–freebies & fun galore! Are you ready? It’s almost here the ScrapMatters Grand Opening 10:00 am PST, Saturday, Sept 29th. Brittney, Shari & I plus the rest of our great team have been working hard to make this a fun, exciting place to hangout. Join us for lots of freebies, prizes and thank you gifts!